World Finals & Spain Championships! 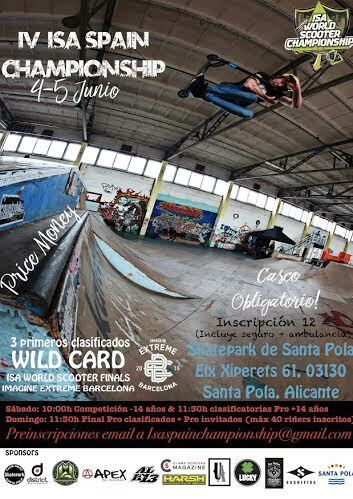 With the International Scooter Association’s annual Spain Championship taking place this weekend, June fourth and fifth, at Santa Pola Skate Park, it is safe to say that the intensity of the ISA competition series is really ramping up. Scooter riders are beginning to travel far and wide to compete for their spot in the freestyle scooter history books, as well as, a spot at the World Championships at Extreme Barcelona in Barcelona, Spain. Many scooter riders who desperately seek one of the final wild card opportunities will be in attendance at this weekend’s Spain Championships, in the hopes of earning their spot in the world final. Along with those many hopeful riders, there will also be us! Lucky Scooters will be sponsoring this weekend’s event, so all of you can expect banners, stickers, product prizes, and free giveaways taking place through out the entire competition. On top of that, there may even be some appearances from some of the Lucky Scooters team riders, but the only way to find out for sure is by making an appearance of your own at the event. So, if you find yourself in the area on the fourth or fifth of June, be sure to stop by and participate in the freestyle scooter mayhem. Specific details of the ISA Spain Championships, including the address, times of the individual events, and event sponsors are all featured on the event flyer, so refer to that for more information. Now for some details on the event that we have all been waiting for! The International Scooter Association’s World Championship competition is set to take place on the 18th and 19th of June, 2016, and things are really starting to heat up around the globe as riders prepare for the big event. The beauty of such an elaborate competition series, which ultimately leads to one world champion, is the fact that it inevitably pushes the progression of the entire sport of freestyle scooter riding forward. Riders are pushing themselves to their absolute limits in order to be able to compete with the best of the best, and with Lucky Scooters having some of the sports top riders, including Tanner Fox, Cody Flom, and Jon Marco Gaydos all competing in the event, its safe to say that we are feeling pretty confident about our chances of taking home a podium spot, especially after witnessing how polished all three of them looked in the United States national championships, which took place just a few short weeks ago. The ISA World Championships are essentially every scooter rider’s big chance to experience true freestyle scooter glory, so none of you will want to miss out on experiencing this event. Regardless of whether you are watching the live feed from home or if you are actually in attendance at the event, this will indefinitely be a piece of scooter history. 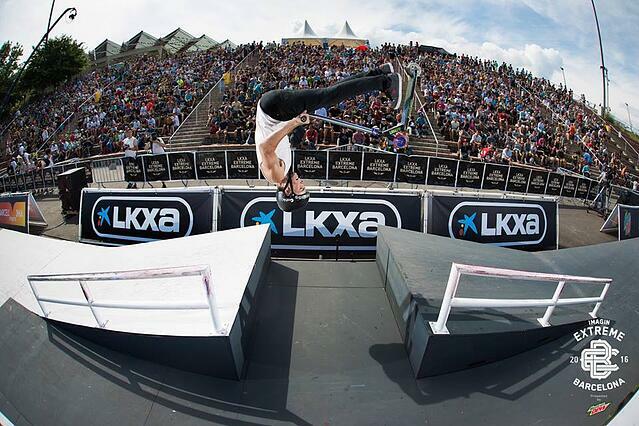 In case any of you missed last year’s ISA World Championships at Extreme Barcelona, be sure to check out the 2015 highlight video below to get a better understanding of what you can expect from this year’s event. Also, don’t forget to stay tuned right here at Lucky Scooters for more future ISA competition news and updates, as well as, any and all other Lucky Scooters related news. Need Lucky parts? SHOP HERE!